Amsco Eagle Ten Autoclave provides clinics with Safe, fast and dependable sterilizer. 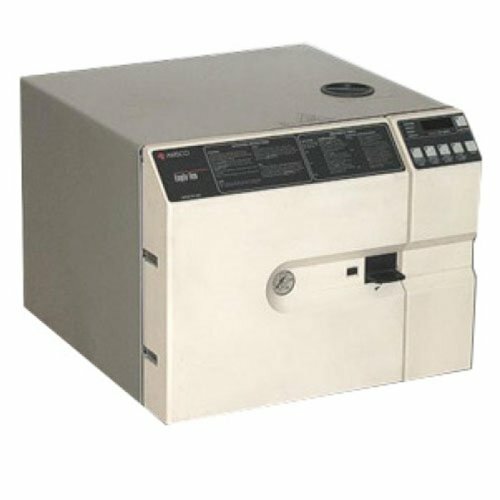 The Amsco Eagle Ten Autoclave is a large capacity, counter-top sterilizer perfect for any size practice. Amsco has been a world leader in sterilization equipment, and the Eagle Ten offers many sophisticated features. The spacious 10″ x 16″ chamber can hold two utensil trays per load for wrapped, unwrapped and liquid goods. The outside dimensions are compact, saving counter space in the work area. Simply select wrapped, unwrapped, packs or liquid sterilization with the touch of one button. Other features include optional programmable controls, self-diagnostic error codes and safe operation. Safe, fast and dependable sterilization. Pre-programmed or programmable cycle selection.